« Sunday Prayer Questions 1: Do you Pray for Your Church? 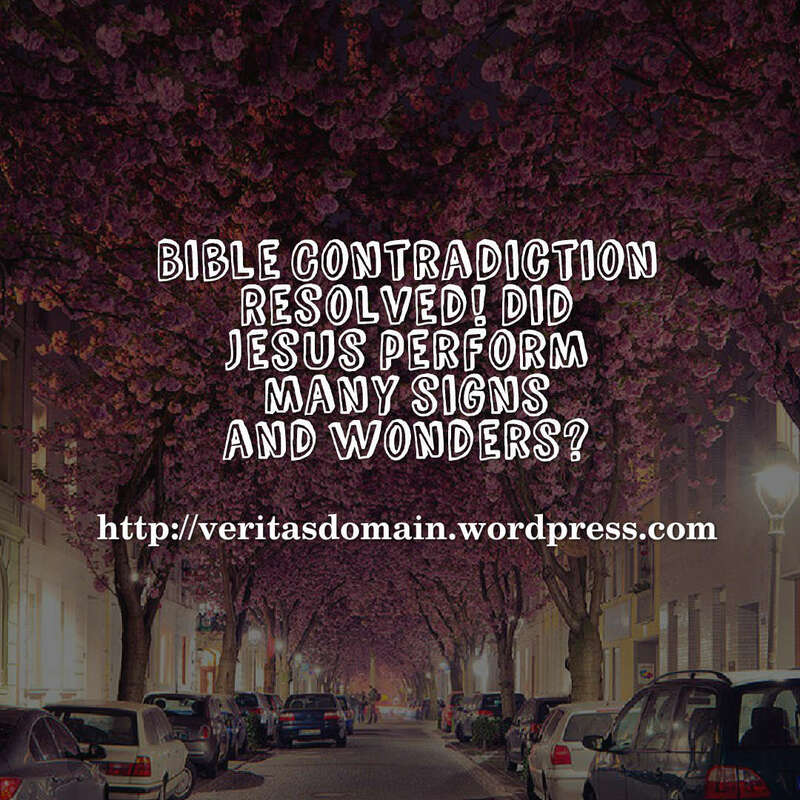 The verses cited as proof that the Bible denied Jesus perform many signs and wonders actually do not deny Jesus’ miraculous works if one interpret them properly and also according to its context. The Skeptic Annotated Bible quoted Matthew 12:39 as a verse to establish that Jesus did not perform many miracles. In the context some of the scribes and Pharisees asked Jesus for a sign (v.38) and in verse 39 is Jesus’ answer. It is true here Jesus said he will not give a sign. But that does not mean he did not do many miracles and offer signs before this. Rather the verse and the chapter of Matthew 12 itself clearly record Jesus performing signs and wonder. Matthew 12:39 cannot be taken to say Jesus did not offer any miracles at all. Here Jesus said that He will give “the sign of Jonah.” In the next verse Jesus explains that this sign means the Son of Man will be alive on the third day after His death (v.40). Looking at the surrounding context Matthew 12:10-13 record Jesus healing a man with a withered hand in the synagogue. Then following that in Matthew 12:17-21 the narrator quotes from Isaiah of a Messianic prophecy of how the Messiah will do many miracle and thus showing Jesus has fulfilled them. If Jesus has fullfilled these prophecies that means He has performed many miracles and signs. Then in Matthew 12:22 we see another instance of Jesus healing a demon possessed man. Note in Matthew 12:24 the Pharisees’ response to all these signs is to say Jesus is able to do them because He Himself is Satan or Satanic. The religious leaders themselves didn’t deny Jesus many miracluous signs and wonder; instead they interpret them wrongly and with extreme bias against Jesus. Not only does this show Jesus did performed many signs, wonders and miracles but it also helps us understand why suddenly Jesus in Matthew 12:39 is no longer going to give any more signs: They have hardened their hearts to the evidences of His miracles, signs and wonder. The Skeptic Annotated Bible quoted Matthew 16:4 as another verse to establish that Jesus did not perform many miracles. In the context this is another time in which the Pharisees and Sadducees asked Jesus for a sign (v1). Again Jesus’ response is to say he’s not going to give any sign but it is better to understand that Jesus meant He won’t be giving any more miracles and not that Jesus never gave any miraculous signs at all. Remember this is still in the book of Matthew and we already saw earlier with Matthew 12:39 how Jesus did do many miracles. Between Matthew 12:39-Matthew 16:4 Jesus actually did more miracles! So it is incorrect to use Matthew 16:4 to say Jesus did not give any miracles or signs. Jesus fed the five thousand (Matthew 14:13-21), walked on water (Matthew 14:25-33), healed a demon-possessed daughter (Matthew 15:21-28), and other healings among the crowds (Matthew 1529-31) and fed the four thousands (Matthew 15:32-38). Likewise what was said about Matthew 12:39 and Matthew 16:4 applies to the final two verses cited by the skeptic (Mark 8:12 and Luke 11:29) to try to demonstrate Jesus did not do much miracles and sign. Both Mark 8:12 and Luke 11:29 are parallel accounts of what Jesus stated in Matthew 12:39 and Matthew 16:4. Both Mark 8:12 and Luke 11:29 can’t be cited to show that Jesus did not do many miracles since the book of Mark and Luke record Jesus’ many miracles. The skeptic again confuses Jesus saying He’s no longer going to perform signs for the Pharisees and religious leaders with the fact that Jesus did perform many miraculous signs for the multitudes. There is no Bible contradictions here. And Amen sister! The Bible is the Word of God, ain’t that right sister? Exactly! Absolutely! To God be the glory for having us with it! I have to wonder if some skeptics realize that we Christians actually read the Bible carefully and in context. Or if they ever think that the Gospel writers might be smart enough to not blatantly contradict themselves in the same document! Oh well. Great post! Its incredible what some of the things skeptics come up with in the Skeptic Annotated Bible. I hope you are doing well Carey, appreciate it whenever you read our post and share your thoughts brother! People are really grasping at straws when they consider those verses to be in contradiction to one another. J.
I think this alleged contradiction is one in which the skeptics are grasping at straws. I realize there are some verses that are difficult to understand but this one is so blatantly not a contradiction if you just simply read the Gospels for even 4 or 5 chapters consecutively since there are so many accounts of miracles! Don’t you think it is rather ironic that the skeptics cite passages which in the context the critics of Jesus’ days are dismissing his miracles with extreme prejudice only for these skeptics to practice their extreme prejudice and say this is a Bible contradiction? Good analysis! I would think it would be obvious to even a hostile reader of the Bible that statements about Jesus declining to perform miracles were connected to the religious leaders. Indeed. This one is probably the most obviously “not contradiction” one listed by the skeptics…isn’t rather ironic that the skeptics cite passages which in the context the critics of Jesus’ days are dismissing his miracles with extreme prejudice only for these skeptics to practice their extreme prejudice and say this is a Bible contradiction? Yes, it is ironic that modern skeptics dismiss Jesus miracles with the same extreme prejudice as the Pharisees. Did you see the latest controversy involving Andy Stanley? He’s distancing himself from a literal understanding of the OT because he says it’s been “dismantled by academia or the realities of life.” So we have a “highly respected” evangelical pastor throwing doubt on the miracles of the OT. Wow I have not heard much details other than someone on Facebook telling me in a sentence that he’s doing that. If you have written up on it feel free to share with us a link! (I’m rather behind on catching up with my blog reading curently). Personally I haven’t given Andy Stanley much of a hearing as I feel Andy’s Stanley’s theology is Cotton Candy (shots fired!). It’s the third story for the last roundup. There was some comment chatter also. Wonderful article. Most of the skeptics I’ve heard don’t really aim for a seasoned and informed Christian. They take Scriptures out of context in order to give other skeptics what they want to hear, as well as plant the seeds of doubt into the minds of new and impressionable followers of Christ. In the time it takes a new Christian to research the truth, the skeptic has moved on to a new argument. God gives us the advantage when He puts us ahead of the skeptic with regular Biblical Study. Thanks for reading this brother. You are so right about the trend of skeptics that they give these arguments to sow doubt but its easier to make things up than to refute it with facts and then they move on to something else. I also thought what you said as the solution is very important for believers: To know God’s Word accurately by regular study of His Word. What should a Christian response to your point be? To put that into practice. Amen brother from another mother! Thanks for the reblog brother Vincent! I always took those verses to mean that Jesus declined to perform miracles on demand for His enemies. Thanks for the reblog! I agree; I personally think the skeptics are trying too hard here to try to reject the Bible, don’t you think? I don’t get those people. You’ve gotta have more to your life than just trying to knock down someone’s religious faith. They are losers. Faith can be either positive of negative. For example, Job said, “That which I greatly feared has come upon me.” (paraphrase.) I believe that in the beginning, Job had more faith in his fear than he had in God. However, at the end, I believe that his faith was in God. If you really think about it, Jesus never did deny the pharisees a miracle. Actually what He told them was that a miracle was about to occur according to their misguided faith. In fact, they were about to see a miracle according to the words of the prophet, Jonah. “If I may take the liberty, my paraphrase of what Jesus said is, “You want a miracle? You are about to get one according to your faith. However, you ain’t gonna like it.””–>I thought that was a good summary Patrick. As usual you always add something to what is written in the post. I welcome your input. Hope you have a blessed day today, are you guys doing anything for Memorial Day?